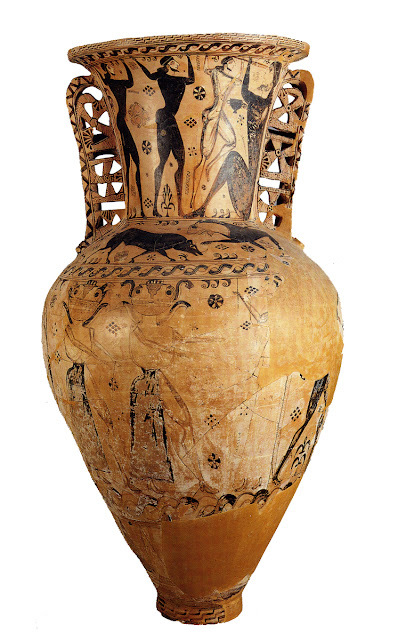 Developed initially in Corinth, the black-figure style in which the vase is decorated builds on the technology of earlier styles of decoration. The natural color of the clay is used as the back ground. Engobe is still used to create a silhouettes and touches of red purple gloss are applied here and there but the polychrome of the vase is supplemented by incising details with a sharp awl. This is sometime referred to as scraffito. 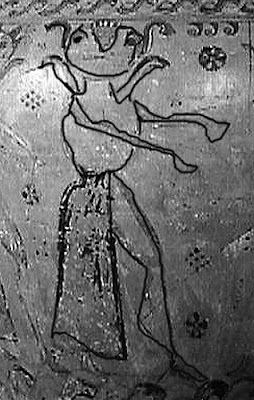 Which means something along the order of scratched designs which is very similar to its cousin graffiti. 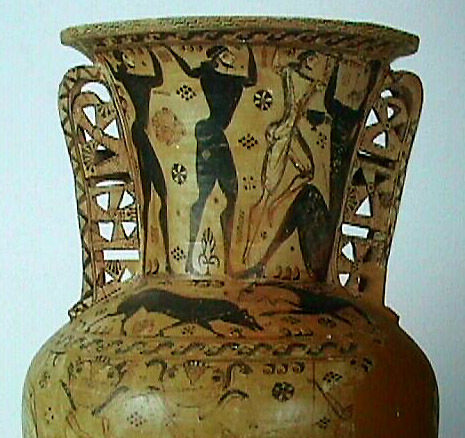 Iconography: The iconography of the vase deals with mythology and legend and outlines the adventures of two clever Greek heroes: Odysseus and Perseus. The top register depicts a scene out of Homer's "Odyssey" the Blinding of Polyphemus. (see Mencher Liaisons 12-14 (The Blinding of Polythemus). Odysseus or Ulysses, conquers the single eyed inhospitable Cyclops through his intelligence and scheming and therefore secures the release and safe journey of his crew.